The 2014 Indian general elections has been regarded as the most important elections in Indian history since 1977. It saw the decimation of the ruling Congress party, a spectacular victory for the BJP and a new style of campaigning that broke every rule in the political game. But how and why? 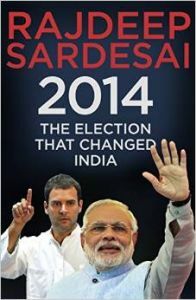 In his riveting book, Rajdeep Sardesai tracks the story of this pivotal elections through all the key players and the big news stories. Beginning with 2012, when Narendra Modi won the state elections in Gujarat for a third time but set his sights on a bigger prize, to the scandals that crippled Manmohan Singh and UPA 2 and moving to the back-room strategies of Team Modi, the extraordinary missteps of Rahul Gandhi and the political dramas of an election year, he draws a panoramic picture of the year that changed India. Page-turning, full of insights and great portraits, and written with a media insider's eye, 2014 is political storytelling at its absolute best. Rajdeep Sardesai is one of the country's most recognised and respected journalists. In a career that started in 1988, he has been anchor, editor and columnist across tv and print. He was city editor of The Times of India in Mumbai at 26, became managing editor of NDTV and later set up the IBN 18 network, including CNN IBN, IBN 7 and IBN Lokmat. A former president of the Editors Guild, Sardesai has won several national and international awards, including the Padma Shri in 2008. He lives in Delhi with wife Sagarika, children Ishan and Tarini and their beagle, Nemo. This is his first book.